Emergency hospital stay? A newborn? It didn’t stop these patients from voting. There wasn’t much Ashley Irwin could do about it. The contractions had started picking up around 10 p.m. Sunday, and they hadn’t stopped when she woke up in the morning. They picked up as she and her husband, Evan Fraundorfer, drove through Oakland, past one of Democratic nominee Hillary Clinton’s final rallies, and to Magee-Womens Hospital of UPMC. The baby was coming. Irwin, a 28 year-old art teacher at Shady Side Academy, secretly hoped her proximity to Clinton might instill some “girl power” in her soon-to-be born daughter and that the birth would go smoothly. But she had another worry: How would she vote? She realized the problem before she left for the hospital, but hadn’t figured out how to solve it by the time she checked in. “I said, ‘If we go tomorrow, I can’t vote,’” Irwin said. She got her answer Monday night. 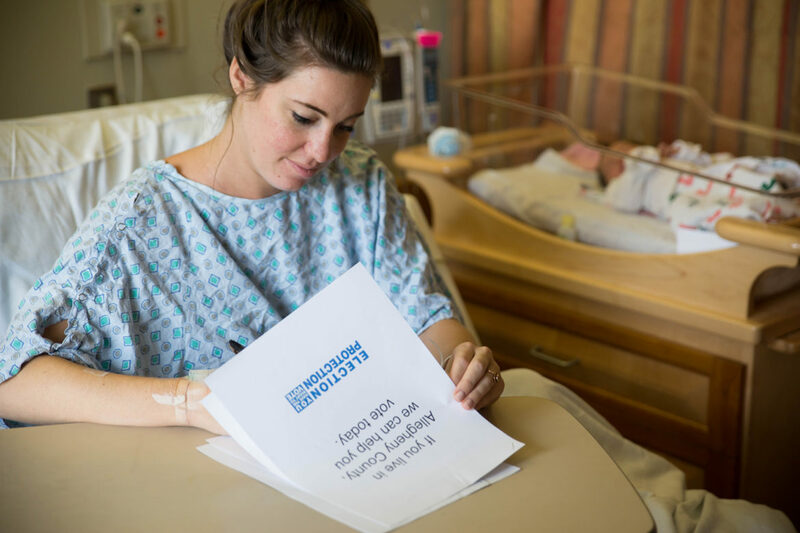 Nurses at Magee and six other UPMC hospitals notified patients that they could apply for something called an emergency absentee ballot if they wanted to vote. What followed was a convoluted, day-long process that would finally let Irwin cast a ballot Tuesday evening, just before polling closed. On a day when millions of Americans would exercise their most fundamental democratic right, a small team of volunteers showed just how wonky that practice can be. First, the volunteers — including representatives of the national Election Protection group that helps get people to the polls — distributed applications for emergency absentee ballots to all of the patients who said they wanted one early Tuesday morning. But voting absentee isn’t a simple as filling out a ballot and sending it in. On that form, patients like Irwin had to fill out their basic voter information and note that they couldn’t vote because they were in the hospital. Then it was time for the signatures. A designated doctor at Magee had to sign each of the 27 forms to verify the patients were there. The volunteers then stuffed them into yellow envelopes. Jean Stone, a nurse who works at Magee and who volunteered for Clinton’s campaign this year, put the envelopes into the backseat of her Volvo and sped to the handoff point. Waiting in front of the City-County building, on the bustling corner of Fourth Avenue and Grant Street, she joked it felt like she was about to meet a drug dealer. In reality, she was waiting to meet Nate Comstock, a lawyer. Shortly after 12:30 p.m., Stone handed the envelopes to Comstock. In the elections office, Comstock stood at the front counter and signed each ballot application so they could go before a judge. Then, as phones rang with questions from voters across the county, staff members in the election office looked up each patient and verified each one was registered to vote. Only one person wasn’t. Then, it was across the street to the City-County building to Allegheny County Judge Jill Rangos’ courtroom, where lawyers for the Democratic and Republican parties checked each form for flaws and Rangos signed each one. Lawyers have the option to dispute the ballot applications at this point, but no one did for Comstock’s Magee set. After getting the judge’s signature, Comstock and Stone could pick up official ballots from the elections office. Stone drove them back to Magee, got them to the patients and took the completed ballots back to the elections office where they could finally, after nearly 12 hours, be counted. This process may not have occurred here locally or possibly at all without the advocacy of Paul O’Hanlon, a lawyer and volunteer with Election Protection. In 2004, O’Hanlon said he heard of a woman who was in a wheelchair and couldn’t vote. She had arrived at her polling station, but found a set of stairs that kept her from the voting booth. O’Hanlon, an expert in election law, thought there must be some way for people who couldn’t make it to the polls and who missed the absentee ballot deadline to vote at the last minute. There wasn’t. “I looked and I looked and I called all of my people, and it wasn’t possible. If you had something happen, you couldn’t vote,” he said. To make sure people with disabilities, like the woman in wheelchair, didn’t run into future problems, O’Hanlon filed a complaint with the Pennsylvania Secretary of State. Though he never got proof that his complaint caused the change, the state Legislature passed a law in 2006 that allowed people who had emergencies to vote via emergency absentee ballot. “It’s difficult and burdensome but at least it exists,” he said. On Tuesday, O’Hanlon and the team of volunteers would help more than 300 people in Pittsburgh’s hospitals cast their ballots. As Irwin cast her vote, still wired up to an IV, her daughter lay beside her, less than a day old. Born at 12:38 a.m. on Election Day, Irwin said she wasn’t worried for her daughter. Sure, the election has been stressful and it's important for the country's future. But as for her daughter's future, she thinks she’s got a few years before they have to discuss politics. Reach J. Dale Shoemaker at 814-215-0509 or at dale@publicsource.org. Follow him on Twitter @JDale_Shoemaker.